Mars Had Big Rivers for Billions of Years, by Mike Wall, Space.com, 27 Mar 2019. Persistence of intense, climate-driven runoff late in Mars history, by Edwin S. Kite et al., Science Advances, 27 Mar 2019. Thanks, Stan Franklin. Life on Mars! has lots more about water there. Role of stellar physics in regulating the critical steps for life, by Manasvi Lingam and Abraham Loeb, International Journal of Astrobiology, online 27 Mar 2019. Neptune's Moon Triton Is Destination of Proposed NASA Mission, by David W. Brown, The NewYork Times, 19 Mar 2019. Thanks, Stan Franklin. Life on Europa, Other Moons, Other Planets?... has related links. NASA's OSIRIS-REx mission is orbiting asteroid Bennu. The plan is to return a pristine 2-ounce sample for analysis on Earth. The surface is surprisingly rocky. 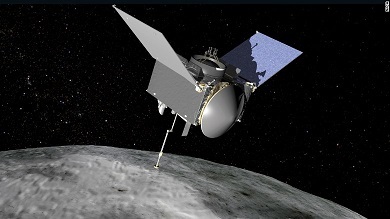 Spacecraft makes 'unexpected' discoveries about asteroid Bennu, by Ashley Strickland, CNN, 19 Mar 2019. The unexpected surface of asteroid (101955) Bennu, The OSIRIS-REx Team, Nature, 19 Mar 2019. A whole suite of at least six bacterial genes was horizontally transferred to yeast. The genes accepted eukaryotic protocols and the yeast acquired a new metabolic pathway. They're calling it Horizontal Operon Transfer (HOT). The horizontal transfer of this siderophore biosynthesis operon has provided an exceptionally illuminating and clearly documented case of the acquisition of a complete multi-gene bacterial operon encoding a complex metabolic pathway by a eukaryotic nuclear genome in a single transfer event. ...Our HOT finding dramatically expands the boundaries of the cross-domain gene flow. The transfer, maintenance, expression, and adaptation of a multi-gene bacterial operon to a eukaryotic host underscore the flexibility of transcriptional and translational systems to produce adaptive changes from novel and unexpected sources of genetic information. Eukaryotic Acquisition of a Bacterial Operon by Jacek Kominek et al, doi:10.1016/j.cell.2019.01.034, Cell, 07 Mar 2019. bioRxiv preprint, online 24 Aug 2018. Yeasts reach across tree of life to domesticate suite of bacterial genes, University of Wisconsin-Madison, 21 Feb 2019. Thanks, Google Alerts and Martin Langford. Viruses... is our main webpage about HGT. Astrobiologists ...consider oceanic hot springs as possible analogues of alien submarine environments on oceanic worlds beyond our planet. ...life in hot springs on the ocean floor by Cindy Lee Van Dover, Nature, 04 Mar 2019. Environment-dependent fitness gains can be driven by horizontal gene transfer of transporter-encoding genes by David S. Milner et al., doi:10.1073/pnas.1815994116, PNAS, online 06 Mar 2019. Viruses... has more about HGT. How hidden webs of information are solving the mystery of life is the subtitle of the newest book by Paul Davies, Director of the Beyond Center for Fundamental Concepts in Science at Arizona State University. After reading in it for four hours, we see no solutions. Maybe deeper research helps for understanding cancer and that kind of thing? But his real aim is to suggest that unknown principles hiding in the physical world will eventually be discovered and allow a realistic account for the origin of life. There is plenty of room at the bottom for novel physics to operate in a manner hitherto undetected and, indeed, that would be very hard to detect at the level of individual molecules anyway (p 213). Davies ranges widely and knows lots of details about the history of modern science, computer science and cellular biology. We paid especially close attention to his discussion of the second law of thermodynamics. There, with lengthy history, he connects thermodynamic entropy to logical entropy. This exercise led nowhere and we emerged still skeptical. Information gets his whole attention, but meaning got almost none. Complexity remained unquantified, and organization was seldom mentioned. At least he agrees that computers are a useful model in biology. Our main gripe is that he assumes things that are not demonstrated. For example, …bacteria have evolved certain 'contingency genes'… (p 114). Yes, they have them, but, no, that they evolved them, as commonly understood, is pure conjecture. Does anyone except us and the IDers object to the misleading usage of evolve? Following a glowing description of Kurt Gödel's logical breakthrough, Davies speculates, Undecidability guarantees that the mathematical universe will always be unbounded in its creative potential. …If life represents something fundamental and extraordinary, then this quality of unconstrained possibility is surely key (p 71). It was that kind of book. 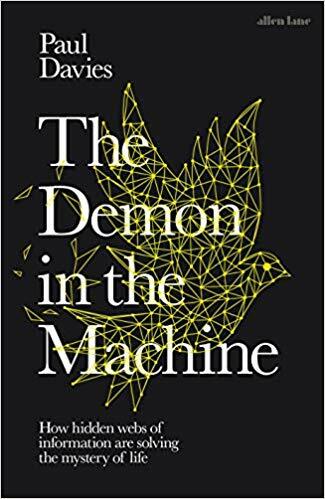 The Demon in the Machine, by Paul Davies, Penguin Books, 25 Sep 2018. The Second Law of Thermodynamics is our main related webpage. The Beginning discusses Gödel. The RNA World, Computer Models... and Macroevolutionary Progress... are related webpages. 18 Dec 2018: Bacteria did not evolve any of three thousand metabolic changes recently analysed. The question is no longer, is there life beyond Earth? ...The question now is, how do we find it? Life... by Jamie Shreeve, photos by Spencer Lowell, art by Dana Berry, National Geographic, Mar 2019. Darwin Devolves, by biochemist Michael Behe, wages frontal assault on the mainstream theory of evolution. A leading proponent of Intelligent Design (ID), Behe is already known for the principle of Irreducible Complexity and its signature example, the bacterial flagellum. Now, following advances in electron microscopy, he has more, equally impressive examples. Looking at the molecular details more closely than most darwinists, Behe notices a lot. For example, many evolutionary advances are consequences of disabling mutations. Hence the title. A disabling mutation may be followed by a regulatory workaround, often the result of another mutation that would, by itself, also be harmful. Several experiments that superficially support standard darwinism actually reveal this sequence of events. Surprising, complex, flying, gliding or swimming images appear in Conway's Game of Life, but its computer program is short. The images are emergent properties. Could my mind be an emergent property, ultimately, of my genetic programming? Behe is quite adamant in his position, and we get the impression that he is preaching to the choir. Too bad that the subject is so polarized. But even Behe seems to like things sharply polarized. Venturing into philosophy he says, …there are two choices: either affirm materialism and deny your own mind, or affirm your own mind and deny materialism. Why?! The value of science is diminished if its laws are sometimes violated by supernatural intervention. Yet miracles seem to be required in ID, even if the IDers, in public, are frustratingly vague on the details. Under these circumstances, no dialog seems possible. We wish darwinists would acknowledge and explore the alarming shortcomings of darwinism — without the absurd notion that they would have to abandon science. Instead, they quickly, briefly, smugly dismisses the valid criticisms coming from ID. More frustration. Students of evolution could learn a lot from Behe. 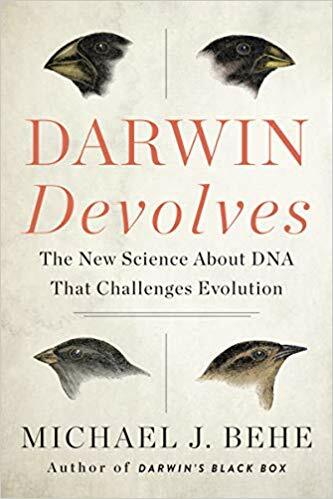 Darwin Devolves: The New Science About DNA That Challenges Evolution, by Michael J. Behe, Harper Collins, 26 Feb 2019. 15 Apr 2019: our comments after Behe is interviewed on Youtube. Evolution vs Creationism is our main related webpage, with several links about Behe. Geological Evidence of Planet-Wide Groundwater System on Mars, by Francesco Salese et al., Journal of Geophysical Research, doi:10.1029/2018JE005802, 21 Jan 2019. Life on Mars! has more. Thanks, William Smith. 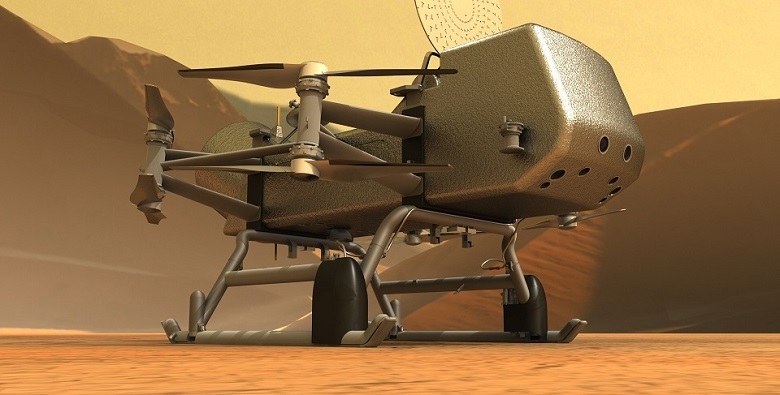 NASA May Decide This Year to Land a Drone on Saturn's Moon Titan by Meghan Bartels, Space.com, 16 Jan 2019. Dragonfly homepage, Johns Hopkins Applied Physics Laboratory. Could a Space Helicopter Find Life on Saturn's Moon Titan? by Kristina Vrouwenvelder, Scientific American, 22 Feb 2019. Life on Europa, Other Moons, Other Planets? has links about hints of life on Titan. Thanks, Stan Franklin. To Mars with Love by Patricia Ann Straat tells the story of the Labelled Release (LR) life detection experiments aboard the two Viking missions, launched for Mars in 1975. She and Gil Levin spent years designing them. She vividly describes the long and difficult job of getting the equipment to work, redesigning it, running simulations, dealing with surprises, and negotiating with NASA. The details of the experimental results and their possible interpretations are fully told. Of course, she and Gil believe they found life on Mars — the results were positive by the preestablished criteria. Still, she thoroughly lays out the alternative explanations. Naturally, she laments the lack of followup for actual life-detection on subsequent missions. And we get good glimpses of her as an adventurous traveler and equestrian. We liked this book! 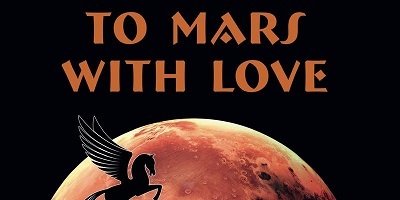 To Mars With Love, homepage by Patricia Ann Straat with comments, contact info and purchasing link. Loving Mars..., a review by Christopher P. McKay, Astrobiology, 07 Feb 2019. Life on Mars! has background and updates about the Viking LR experiments. Our results highlight the importance of reticulate evolution in eukaryotes, by showing the crucial contribution of HGT and gene fusion in the evolutionary history of the nitrate assimilation pathway. Reticulate evolution in eukaryotes: Origin and evolution of the nitrate assimilation pathway, by Eduard Ocaña-Pallarès et al., PLoS Genet., 21 Feb 2019. Viruses... is our main webpage about HGT. Earth probably harbours a million times more virus particles than there are stars in the observable Universe. Classify viruses – the gain is worth the pain, by Jens H. Kuhn et al., Nature, 20 Feb 2019. ...we show that large blocks of DNA containing functional genes are laterally passed among distantly related species. "Lateral transfers of large DNA fragments spread functional genes among grasses" [abstract] by Luke T. Dunning et al., doi:10.1073/pnas.1810031116, PNAS, online 20 Feb 2019. Viruses and Other Gene Transfer Mechanisms is our webpage about HGT. The Cambrian Explosion was sudden, according to English and Australian geo-scientists who reexamined trilobite fossils. They apparently changed quite rapidly. We conclude that the Cambrian explosion was over by the time the typical Cambrian fossil record commences and reject an unfossilized Precambrian history for trilobites.... This makes sense to us, if newly acquired genes undergo strong positive selection at first. "Trilobite evolutionary rates constrain the duration of the Cambrian explosion" [abstract] by John R. Paterson et al., doi:10.1073/pnas.1819366116, PNAS, online 19 Feb 2019. Neo-Darwinism: The Current Paradigm has a discussion of Punctuated Equilibrium, with updates. Metazoan Genes Older Than Metazoa? considers molecular clocks, utilized in the new study. Fungus from Antarctica could survive on Mars, according to ESA's experiments on the International Space Station. "Responses of the Black Fungus Cryomyces antarcticus to Simulated Mars and Space Conditions on Rock Analogs" [abstract] by Claudia Pacelli et al., doi:10.1089/ast.2016.1631, Astrobiology, online 11 Feb 2019. Life on Mars! has background and updates. NASA declares the Opportunity rover dead. It landed on Mars in 2004, designed to last three months. Instead it lasted fifteen years, exploring farther than anyone dreamed. That stupendous success makes everyone proud. We only wish that NASA had paid full attention to a fossil that Opportunity photographed on its 34th Martian day. A fossil on Mars... and ...evidence for life...? are our postings about the fossil. NASA's Mars Rover Opportunity Concludes a 15-Year Mission, by Kenneth Chang, The New York Times, online 13 Feb 2019. 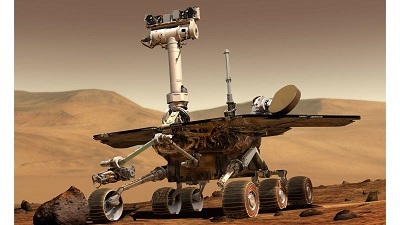 Opportunity lost: NASA says goodbye to pioneering Mars rover, by Alexandra Witze, Nature, 13 Feb 2019. Thanks, NPR. It's not that individuals do better (differentially reproduce) within species because they have selfishly accumulating TEs, but that species harboring selfish TE-burdened individuals do better within clades (differentially speciate or avoid extinction) because, just occasionally, a copy of a TE gives rise to a genetic innovation. Doolittle and Brunet are well aware that horizontal gene transfer (HGT) has a major role in evolution. We wish they would wonder how or where tranferred informational genes got their information. We think darwinian logic does not stretch far enough. On causal roles and selected effects: our genome is mostly junk, by W. Ford Doolittle and Tyler D. P. Brunet, doi:10.1186/s12915-017-0460-9, BMC Biology, 05 Dec 2017. Almost 80% of the genome is biochemically active (about ENCODE), posted 06 Sep 2012. A lot of organic chemistry is no doubt happening on Titan — Kelly Miller, cosmochemist. SwRI scientist sheds light on Titan's mysterious atmosphere, Southwest Research Institute, 22 Jan 2019. Saturn's Biggest Moon Titan May Bake Its Own Atmosphere, by Sarah Lewin, Space.com, 26 Jan 2019. We think this evidence may point to life. Thanks, Stan Franklin. The Society of Genes takes Richard Dawkins's selfish genes a step further. It compares genes to individuals on a kibbutz, where occupations may be subdivided, or to movie actors who change roles. In several examples, the functions of networks and their cascades of logic are especially well explained. Adaptation, or microevolution, gets close attention, as with the opsins for tri-color vision, enabled by amino acid substitutions. The writers know plenty about horizontal gene transfer affecting prokaryotes, but disappointingly, not eukaryotes. Thus the genes they need for major innovation, or macroevolution, do not get serious consideration. Still, the analogies, examples and illustrations are commendable, and the writing is friendly. 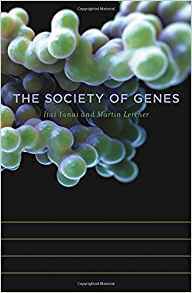 The Society of Genes by Itai Yanai and Martin Lercher, Harvard University Press, 11 Jan 2016. 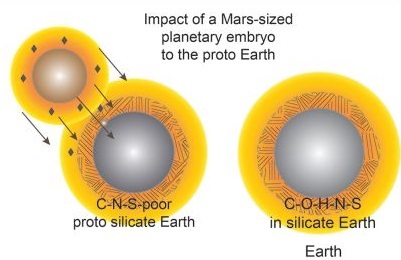 ...we show that the impact of a Mars-sized planet, ...coinciding with the Moon-forming event, can be the source of major volatiles in the BSE [bulk silicate Earth]. Experimenters at Rice University conclude that the previously-favored scenario for supplying prebiotic organics needed this revision. Delivery of carbon, nitrogen, and sulfur to the silicate Earth by a giant impact, by Damanveer S. Grewal et al., Science Advances, 23 Jan 2019. A Collision ...May Have Seeded Earth With the Ingredients for Life, by George Dvorsky, Gizmodo, 23 Jan 2019. Thanks, Karen Riss and Stan Franklin. 13 Jan 2019: a related story prompts our reminder of the software problem. The RNA World and other origin-of-life theories mentions a variety of scenarios. Microbial life found under 1,100 meters of ice in Lake Mercer, Antarctica, makes similar life on ice-covered moons elsewhere seem possible, or even likely. Relics of crustaceans and tardigrades were found in the sediments! Scientists find new evidence of life beneath Antarctic ice by Andrew Freedman, Axios, 17 Jan 2019. Tiny animal carcasses found in buried Antarctic lake, 18 Jan 2019; and background: The hunt for life below Antarctic ice, 12 Dec 2018, both by Douglas Fox, Nature. Thanks, Rob Cooper, Gordon Cooper and Stan Franklin. Life on Europa, Other Moons, Other Planets? and Earth-analogs for those environments has links to more. If you give me 8-mers, I'll give you life, says Niles Lehman of Portland State University. Last October, in Atlanta GA, he was one of the chemists among geologists, biologists and planetary scientists at an origin-of-life workshop. The theorists are excited about a new possible scenario — 4.47 billion years ago, one or more major glancing impacts left Earth covered in a cloud of molten iron and other debris. When the cloud cooled, a reducing atmosphere favored the formation of organic molecules. These then created life by way of the RNA World. The hardware aspect of the origin-of-life problem is very far from solved, and theorizing continues unabated. When someone sees a potential workaround for one of the admitted difficultes, a celebration ensues. A few of the other puzzles get mentioned, as if they too will soon be solved. Realistic demonstrations of the whole process are deemed unnecessary. Meanwhile, the software aspect of the problem is completely ignored. We remain skeptical. How an ancient cataclysm may have jump-started life on Earth by Robert F. Service, Science, 10 Jan 2019. Thanks, Ted Steele. The RNA World is our webpage about origin-of-life theories. 24 Jan 2019: a related theory. From bugs to humans, scientists say we all came from deep space by John Elder, NewDaily, 12 Jan 2019. ...all the central assumptions of the Modern Synthesis (often also called Neo-Darwinism) have been disproved. — Denis Noble, doi:10.1113/expphysiol.2012.071134, Exp Physiol, 2013. Thanks, Stan Franklin. Neo-Darwinism: The Current Paradigm lists some of these assumptions. In conversation with Prof. Chandra Wickramasinghe..., DailyMirror, Sri Lanka, 03 Jan 2019. more about Chandra.